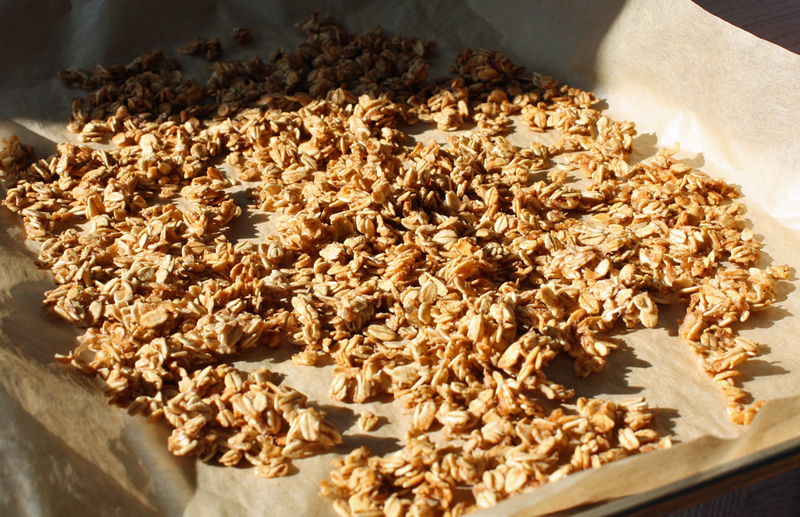 Granola fresh out the oven cooling on parchment paper. 1 cooked apple. Use these instructions. Or use about 3/4 cup applesauce. Mix oats, salt, cinnamon. Set aside. Preheat oven to 240 degrees F convection. If not using convection, preheat to 300. Cook apple, if using. Use these instructions: Spiced Apple In 5 Minutes, omitting any salt and spices. Heat cooked apple (or apple sauce), maple syrup, honey, and vanilla gently for one minute. Combine apple mixture and oats in a large bowl. Mix until all oats are moist. Spread evenly and thinly on a lined cookie sheet. Cook for about an hour, stirring every 15 minutes, until golden brown. I created this recipe in an effort to use up a bag of extra thick oats. They actually work better for granola than regular old fashioned oats. Bob’s Red Mill makes them. Using convection bake instead of regular bake allows you to use a lower temperature which helps the granola get dry and crispy before it gets brown, a benefit when you’re not using oil. The movement of air aids crispness too. Fine Cooking has a great little video that explains how a convection oven works. I’ve added a link below. You’ll regret not using parchment paper. I did! I store it in a brown paper bag at room temperature to keep it crispy. This entry was posted in Uncategorized on September 22, 2017 by Bix. This looks delicious. I’ve been looking for a simple recipe for granola. Some have so many steps and rather wild ingredients. I’ll try this probably adding nuts and raisins/currants too. The options go on and on. Thank you. Also regarding Consumer Lab, I’ve subscribed to it for several years, always look forward to what they have to say. Now have some doubts as to how the info is obtained. Very interesting.